The market of wearable device is growing day by day. And the fact that many wearables are overpriced, yes, I’m talking about Apple Watch Series 3, Samsung Gear S3, and Tag Heuer Connected, Chinese well known electronic mogul, Xiaomi, tries its luck on sweeping this market by releasing their very own Xiaomi Amazfit Pace. Offered in such an affordable price, is this Amazfit Fitness Tracker worth buying? Here is what we think about it. Maybe some of you are already familiar with Xiaomi Mi-Band, a highly considerable fitness tracker that’s offered in such an affordable price. Not stopping on that model, the company released another model called Xiaomi Amazfit Pace. Unlike the Mi-Band, this Amazfit Fitness Tracker has more like traditional watch-like body instead of following the simple wrist band design from the Mi Band. Combined with comfortable and futuristic strap, the design of this smartwatch is such a statement. Just like other pricier competes such as LG Watch Style, Samsung Gear S3, this Amazfit Fitness Tracker has round watch face with round edge as well. This watch face is framed with glossy ceramic or zirconia cement material which is scratch-resistant. Having a real thick bezel with IP67 certification (water-resistance), the tough impression is strongly reflected from the watch. About this watch face impression, Make of Use gives a strong impression that the Xiaomi Amazfit Pace watch has a strong first impression. Moreover, it also has nice packaging, and the watch face is a bit low profile and not standing out too much. So definitely, this kind of design is perfect for those who wants the connected features of the most watches with rectangular face that we see in most models. Surrounded by the bezel, we can see a 1.34-inch display of Xiaomi Amazfit Pace that has 320 x 300 screen resolutions. With this kind of resolution, small text can be seen clearly and vividly. Thanks to transflective touchscreen display used. It makes the screen is visible even under direct sunlight. To complete the functionality of the screen, this Amazfit Fitness Tracker is also equipped with automatic brightness adjustment. However, what’s quite a bit annoying is that this feature seems to not working that well because a lot of times, the screen doesn’t increase the brightness when it’s needed. So, we have to increase the brightness manually. Moving to the strap, the Xiaomi Amazfit Pace has black strap with orange accents inside. This strap is durable, and sweat resistant. So, it’s quite comfortable to use. It’s also designed also looks unique and fresh at the same time, especially due to its color combination. But, for you who think that orange is just a bit too much, you can change the strap with any 22mm standard strap. At the edge of the Amazfit Fitness Tracker, there is a small button, which is almost invisible. The fact that you’ll need to press this little button first in order to be able to use the touchscreen is a little bit annoying. As quoted from Amazfit Pace review on Android Authority, the watch case has a tiny physical button which is located on the top-right edge. This button acts as home button and a way to wake up the device. However, this button is small and inconspicuous. That’s why they think that this is one of the watch’s primary downfalls, especially when many other products offer simpler mechanism where touchscreen can be accessed easily by rotating the wrist or simply touch the screen. Under the hood, the Xiaomi Amazfit Pace is powered by 1.2GHz dual-core processor along with 512MB RAM. While for the storage, it has 4GB of internal storage. With this specification, the tracker promised you a fast processing system with minimum lag. Moving into the sensory aspects, Xiaomi brings various sensors into this Amazfit Fitness Tracker to support its functionality. Let’s say the heart rate monitor sensor and sleep monitoring sensor. These will definitely useful for your daily fitness routine. For the Heart Rate Monitoring system, this Amazfit Fitness Tracker uses PPG sensor that is placed on the back side of the device. Using the newly-developed algorithm, this sensor will effectively monitor user’s heart rate and shows quite accurate results. From some reviews, it’s even said that the result of this fitness tracker heart rate monitoring is close enough to the result of Apple Watch. While in the activity tracking function, we have to say that Xiaomi Amazfit Pace is actually has limited activity tracking function. So far, it’s only limited to running and biking. Therefore, for other activities except those two, user need to choose the one that is close to running or biking. To do this activity tracking, you will need to get to the activity tracking menu. After the activity tracking is running, the device will monitor the heart rate and collects many other data. All these data includes calories burned, distance travelled, time, etc. Besides, due to the present of GPS feature, this device can also do motion tracking. Motion tracking here collects data such as distance, pace, elevation, cadence, etc. There are several reasons of why Xiaomi bring 4GB of internal memory Xiaomi Amazfit Pace with 2.4 GB as usable memory. Yes, one of the reasons is to save your music. With this memory, you can store your favorite music there and play it anytime you want. Although this Amazfit Fitness Tracker doesn’t have jack port, you’re still able to listen to the music using Bluetooth headphone. Another notable feature is the payment service it has. Even though it doesn’t support mainstream payment system such as Google or Apple Pay, but it does support AliPay Service. With this service, you can simply pay your bill at supermarket or stores simply by doing simple scan. Therefore, you don’t need to take an effort of taking out your credit card from your wallet, which can be a bit uncomfortable. In the connectivity sector, Amazfit Fitness Tracker has Wi-Fi and Bluetooth 4.0. These will help your tracker to connect to the internet network easily. While for the battery, the Xiaomi Amazfit Pace has A 200 mAh capacity battery. On paper, this battery can make the device stay until 5 days in cruise duration, and 35 hours in GPS running mode. While for the charging hours, it is about 3 hours. What’s unique from this charging system is that Xiaomi already apply magnetic charging mechanism. That’s why you may not find any charging port anywhere on the device. If it’s related to the price point, Amazfit Fitness Tracker Pace is a good smartwatch. I mean, with such an affordable price, we already get a good looking smartwatch with accurate heart rate monitor. Yes, the smartwatch is good looking. The color combination is good, the screen is good, and the watch interface looks elegant and tough at the same time. However, there are some aspects that we think quite annoying about the device. One of them is the the touchscreen mechanism which is a little bit complicated. As explained before, we need to press the button on the watch side to activate the touchscreen, which for us is very impractical. And also, the fact that we can’t interact with the notifications on Xiaomi Amazfit Pace is a bit disappointing too. Indeed, the device shows phone call, message, or application notification. But, there is nothing we can do about them. We still need to access our smartphone to see what these notifications are about. As for the price, it’s been stated before that this device is offered in such an affordable price point. Yes, the price is affordable, which is around 100 USD. 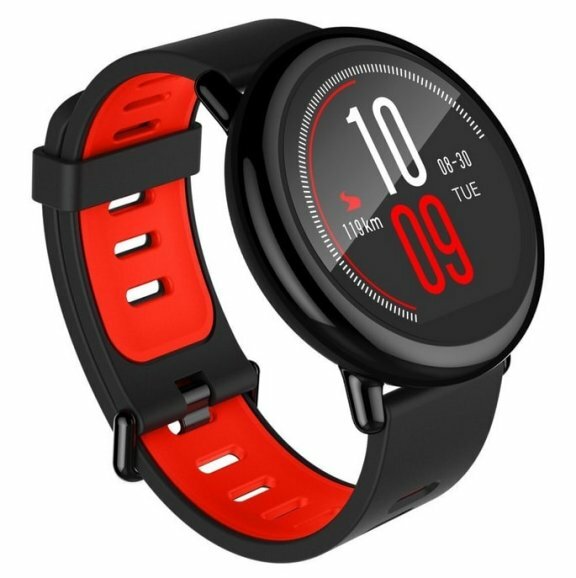 You will never find any other smartwatch in that price point who offers heart rate monitor, right? So, looking at the price tag nominal and features offer, we think that Xiaomi Amazfit Pace could be a good deal to take.